Some small tweaks to the random encounters. This mod is shared with a WML 1.0 Cathedral License. - Redistribute this work in unmodified form. - Give the author(s) credit. - link back to this page. - distribute your mod under the same license. Translations are allowed under the same terms. - Bethesda Softworks: for Skyrim and the ability to mod it. - The entire modding community: for being awesome. -> Changed condition from "Player level 8" to "having completed Diplomatic Immunity". This is done for Thalmor/non-Dragonborn playthroughs. v1.1 -> added new condition: having completed "Missing in Action". -> Changed condition from "Player level 4" to "having completed Dragon Rising". This is done for non-Dragonborn playthroughs. -> Removed condition "having completed a Chance Arrangement". This is done to see thieves even without doing the Thieves' Guild quests. -> Give him/her a chance to spawn with 1 or 2 shivs. This is done to make it a bit more challenging. -> Raised minimum required player level from 5 to 25. Gave it 50% less chance of happening. 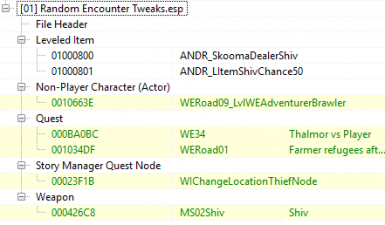 For a list of all random encounters, see here.